A very basic function of business intelligence solution is to help companies drive success in every department by giving complete insight into its critical operational data. Business intelligence solutions consist of multiple components such as BI reporting, applications, analysis tools and consulting. Our Business intelligence solutions are created across various business areas and industries. EzDataMunch has done the hard work in finding out what works and what doesn’t work in your business area. We have already identified the critical KPIs, performance metrics and reports that you would like to see as a business user. You need to just plug in your data, access your account via web and get going! It is as easy as it can get! You can slice and dice your data and understand the relationship between them without writing a single code and having to go back to IT to change anything? It take on an average two hours to learn how to build your own reports the way you always wanted to! So try on EzDataMunch today, there is no easier way to to discover the trends, highlights, goals, hits and misses that you always wanted to do! Business intelligence solutions: Industry Dashboards and Reporting. See how multiple industry drives meaning from their data and make informed decisions by using EzDataMunch’s BI dashboards and reporting tools. Increase revenue by providing intimate customer experience, reduce cost, track branch performance, manage workforce as per season and ensure marketing success. Uncover business opportunities, gain customer insight, track and improve branch performance, make better products and ensure profitability by using our BI banking dashboards. Improve forecast, ensure supply as per demand, align operations with market conditions and reduce cost. Provide right product to right customer, analyze customer history to track suspicious claims and give the best price at the right time to increase profit. Improve student performance by measuring teacher’s effectiveness and increase student enrolment. Ensure manufacturing success by getting real-time visibility across production, supply-chain and demand. Deliver qualitycare, reduce patient wait time and improve profits with our healthcare business intelligence dashboards. Do more up sell and cross sell, align operations and offerings as per the market trends, retain customers by providing better experience and deliver better product packages to maintain profits. Adjust to market trends, ensure supply chain efficiency, manage stock optimally, retain existing customers and get new one with our retail business intelligence dashboard. Get complete insight into property performance as per various geography, understand market trends, foreclosures, delays or defaults and get real-time property information. Uncover business opportunities across various channels, deliver high quality services to maintain customer loyalty, grow business in Mobile, TV, Print and Internet. Selecting the right BI reports / dashboard tools as per business size and industry. Design system architect for them. Train business users on newly implemented BI tools. Impart best practices to extract optimum value from BI software initiative. 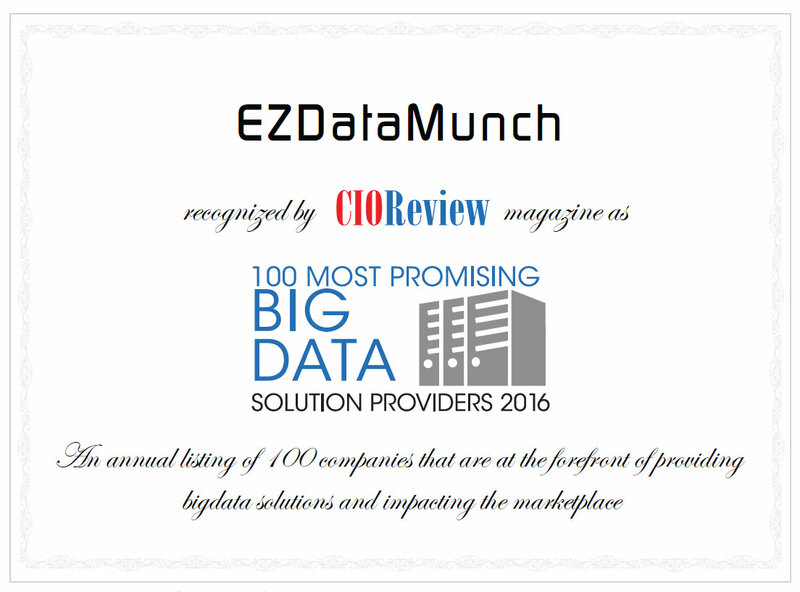 EzDataMunch provides best of both the worlds under one roof. We are the only company whose business intelligence solutions comprises of pre-built ready to use industry specific BI dashboards and high level consulting services. Also, we are the only company to provide online business intelligence app store with over 100 dashboards to choose from for every department and as per job function. We have identified the most important metrics and KPIs that impact the bottom line and operational excellence of every department. 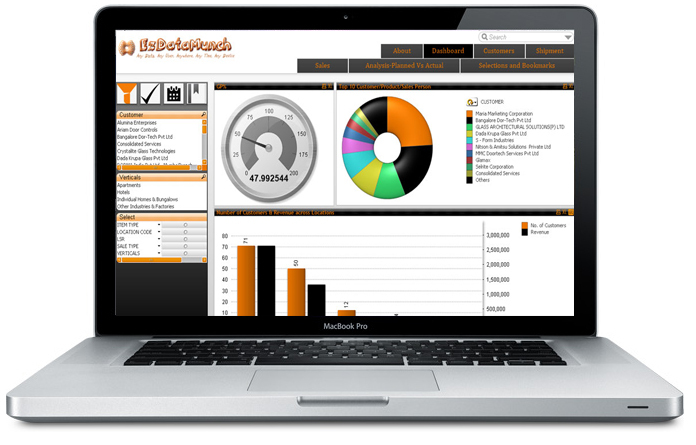 Our BI reporting and dashboards provide quick, EZ, accurate and real-time information. Be it an analyst sitting in the office or a representative on the field, our business intelligence solutions enable business users at every level to access the single version of truth and take informed decisions anytime anywhere. All you need to do is just plug in you data and start playing.